Ah, the Red River. 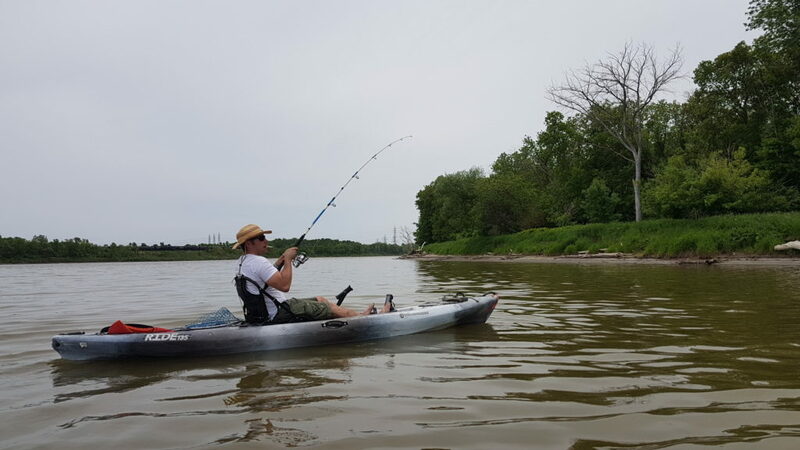 Home to walleye, drum, sauger, bullheads, the list goes on but of course the main attraction is the giant channel catfish. I’ve fished this river nearly my whole life, and yet I still don’t get tired of catching these magnificent fish. 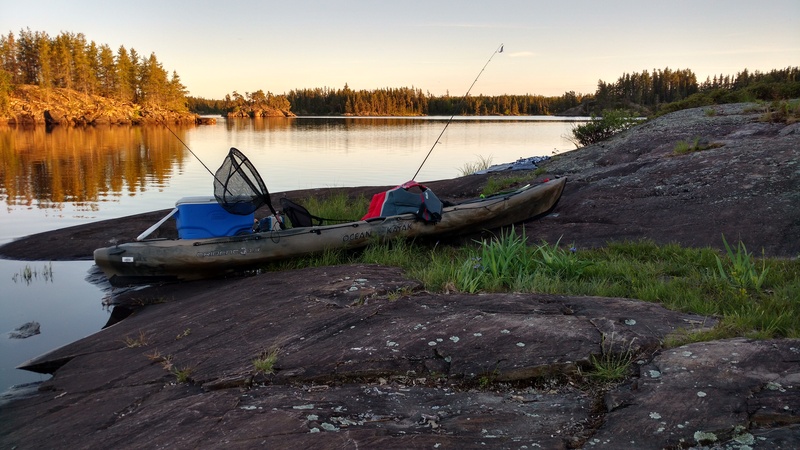 It had been awhile since my last visit, and my friend Cam was dying to get out there with me, so when our days off finally lined up we packed up the gear and made the trip. 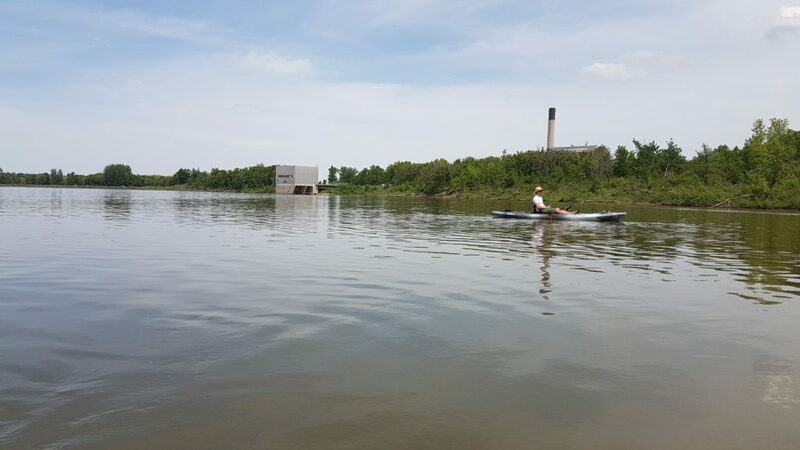 The weather was perfect for paddling, with the sun shining and the water nice and calm. We headed to one of the areas that I normally do very well and dropped our lines in. It wasn’t long before we started getting some bites, although we were having some trouble setting our hooks. Getting bites was a good sign though, and we kept at it, moving down the shore every few minutes. It didn’t take too long before Cam finally got a hook set and started reeling. 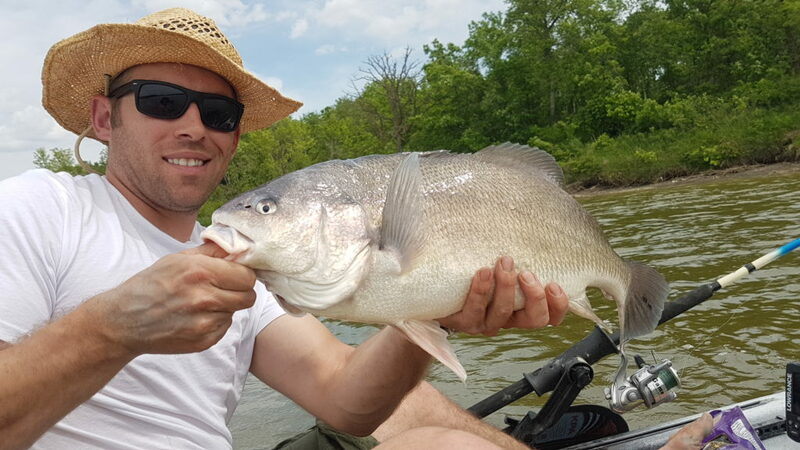 After a short but intense fight, he brought up a nice little freshwater drum. Not exactly what we were fishing for, but still a whole lot of fun to bring in. We tossed it back, and carried on our hunt for big kitties. 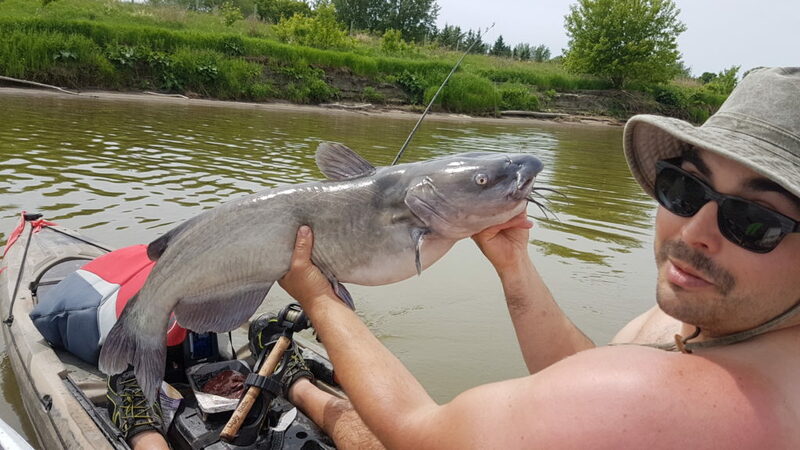 Like almost any fish, catching big channel cats is usually about finding the right depth, and we were struggling to find that magic number. We fished up and down the shoreline and pulled in a lot of drums, but could not seem to hook into any cats. We had shrimp and beef liver, and neither seemed to be enticing anything other than drums. As we were sitting at one of the spots, Cam’s rod suddenly bent right down and he started reeling like a madman. 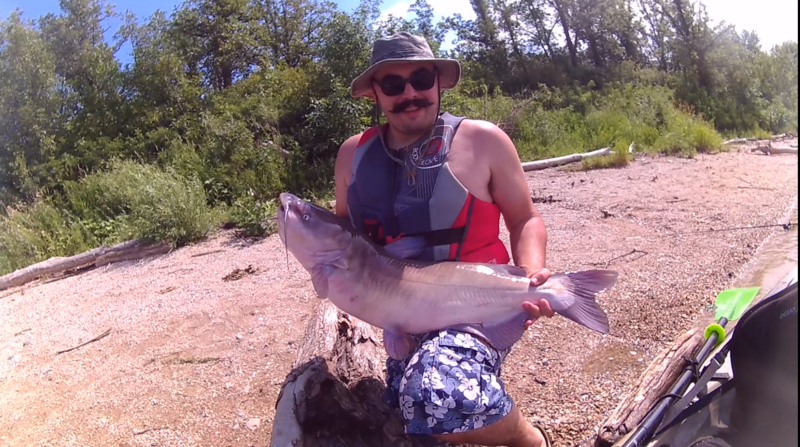 I thought he had finally hooked into a catfish, but as I watched, he pulled out another drum. This drum, however, was a monster! 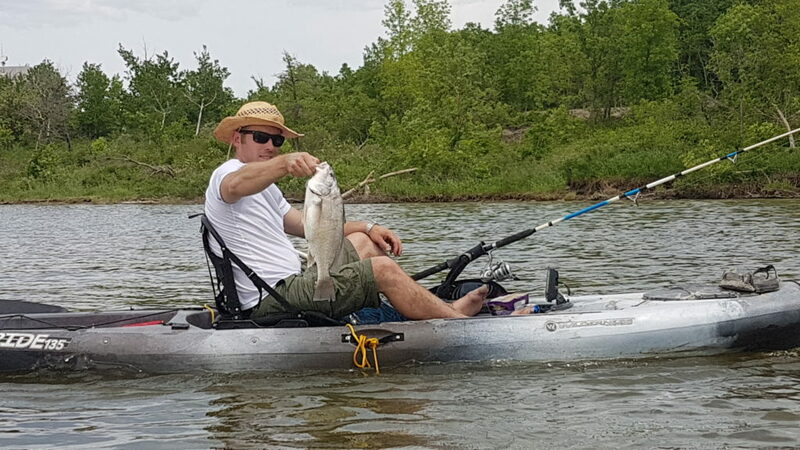 He netted it and as he took out the hook, I paddled closer for a better look. This thing was huge. As I got closer though, and before I could snap a picture, it flopped out of his hands and right back into the water. The look of embarrassment on his face was pure hilarity for me, but I couldn’t help but feel for him. Redemption came soon after, however, as his rod bent yet again and he pulled in the exact same fish! This time around he got a firm grip and got it on the boat. The drum was almost 25 inches long and had a massive belly on it. This was Cam’s first master angler drum, and it was a beauty. Catching a specimen like this certainly helped to break up the day, however I still felt a little bad that we hadn’t seen any catfish yet, so we soldiered on up to the next section of shoreline. Near the end of the day, my line started to spin out through my drag. I finally had a catfish on the line, and it had some weight to it. After a good long fight back and forth with the fish I finally got it up to my boat and wrestled it up onto my lap. For the fight that it gave me, I was expecting a much bigger fish, to be honest. This one measured in at 33 inches, just shy of the master angler length. It had some good weight and a big belly, as you can see in the picture. 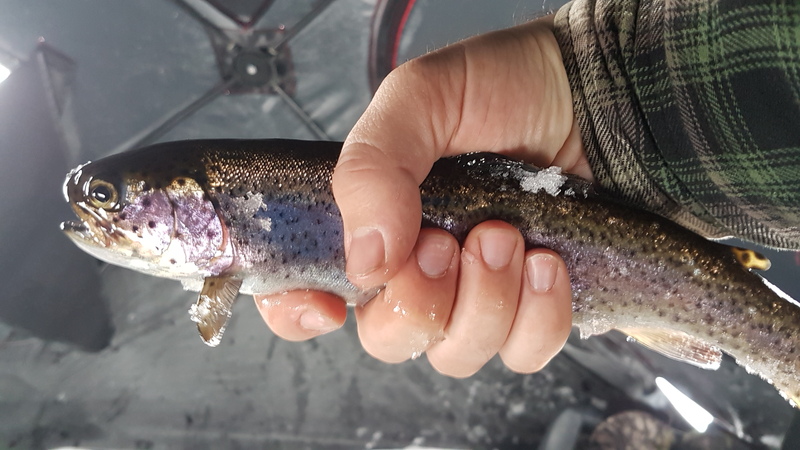 Although it was a bit disappointing that I didn’t have another master angler, I couldn’t argue with the fight and adrenaline rush of pulling this baby in, and after a few pictures I released it safely into the water. For his part, Cam was just happy to finally see a catfish, and we wrapped up the day shortly after. The final tally for the day was just the one catfish, a whole lot of drums, and the master angler. It would have been nice to find more kitties, but I was happy to at least get one. Cam was happy just to catch fish, so all in all the day turned out just fine!